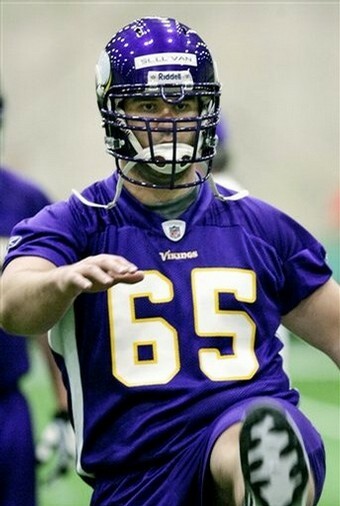 Birk is a career-long Viking who will play 2009 with another team (ravens) for the first time since he joined the NFL. He was an incredible mainstay in the middle of the Vikings offensive line for a decade, but now we need to start looking forward and see who’s going to step up and be the man to pick up where Matty B left off. Sullivan is probably the favorite to win the job. He is a hard-nosed player that has really good football smarts. He has actually drawn a lot of comparisons to Matt Birk since his time with the Vikings. He was known as a better pass blocker than a run blocker at Notre Dame and also struggled with the shotgun snaps, but after learning behind Matt Birk for a year, do not be surprised if many of those issues have been ironed out. The Vikings drafted Sullivan in the 6th round last year. Cook has drawn plenty of criticism from Vikings fans ever since the Vikings drafted him in the second round in 2006, which is the pick that the Vikings received for trading Daunte Culpepper. Cook was never projected as a guy who should be immediately thrown into a starting lineup, and especially not as a starting offensive tackle. Cook should get a chance to hit the reset button on his career by competing for the starting center position where he should be able to be much more effective. The Vikings got good value Sunday night when they were able to agree to terms with Cooper who was projected as a 5th round prospect but slid and went undrafted. As a three year starter at Oklahoma, Cooper seemed able to make up for his small stature and lack of power by utilizing his speed, quickness, smarts, and technique to out-do his opponents. Cooper is not your prototypical center because of his small size, but if he was going to thrive anywhere, it’d probably be on a team that has a zone-blocking scheme like the Vikings do. While I would be surprised if Cooper cracked the 53 man roster this year, I’d also be surprised if he didn’t eventually turn into a solid NFL center.